Later that morning, Union Brigadier General Solomon Meredith, a Mason from Indiana, and Colonel Lucius Fairchild, a Mason from Wisconsin, met and held the Confederates on the bloodied fields and woods between Herr’s Ridge and the Seminary for over 8-hours. Among those attacking Meredith’s legendary Iron Brigade and Fairchild’s hard-fighting 2nd Wisconsin Intantry regiment was Con-federate Colonel James Connor, a Past Master of Landmark Lodge in Charleston, South Carolina. Colonel Henry Morrow of the 24th Michigan was with Meredith’s Iron Brigade. During the furious fighting, Mor-row was struck in the head by a Confederate bullet. Later, a Confederate surgeon, identifying himself as a Mason, decided that Morrow’s scalp wound was “too serious” for him to be marched away as a prisoner-of-war. This act of Masonic compassion probably saved Morrow’s life. According to Lieutenant General James Longstreet, Commander of the Confederate First Corps, the most gallant charge of the entire war was led by Brigadier General William Barksdale, a Mason from Jackson, Mississippi. When Longstreet ordered him forward, Barksdale was on the front-line. It was in that position, after forcing the Union lines to col-lapse and retreat, that he was shot—mortally wounded—wearing a clean white linen shirt fastened with Masonic studs. Consider the significance of this act, when soldiers in the midst of a major battle, take the time and care to bury an enemy soldier! Unusual in every sense of the word, but not so unusual when you consider that it happened between Masons. While the entire southern end of the battlefield erupted with savage fighting at the Peach Orchard, the Wheatfield, and Devil’s Den, a hero was born on the rocky, wooded southern slope of Little Round Top. Colonel Joshua Lawrence Chamberlain, formerly a language pro-fessor at Bowdoin College in Maine, was in command of the 20th Maine Infantry defending the critical Union left flank. The determined Confederates launched attack after attack against Chamberlain’s shattered line. The gallant defenders held their position heroically despite their fearful losses. Running out of ammunition, and without reinforcements, Chamberlain knew that the next Confederate attack would destroy his line and cause the loss of the Federal armies strong defensive position. It was then that Chamberlain, a man schooled in religion and language, ordered his men to fix bayonets and charge the attacking Confederates in a swinging barn-door like maneuver. His unorthodox attack shocked the Rebels, causing them to scatter in hurried retreat. Chamberlain was a Mason, a member of United Lodge in Brunswick, Maine. He would receive a Congressional Medal of Honor in recognition of his courage and heroism at Gettysburg. While Chamberlain was gallantly defending the southern end of the Union’s fish-hook shaped line, another Mason was desperately trying to overrun the Union army on the opposite end of that line on Culp’s Hill. John Brown Gordon, a successful businessman and lawyer from Georgia, had fought with brilliance throughout the two years prior to Gettysburg. Gordon had been severely wounded nine months earlier at the Battle of Antietam (September 17, 1862). A bullet hole in his hat had saved him from drowning in his own blood as he lay unconscious on the battle field. Gordon was a man of extraordinary compassion and care—a trait taught at our fraternities holy altars. During Gordon’s attack on the first day, which resulted in the Confederates forcing the Union Army to retreat from their position in the fields north of Gettysburg, Union Brigadier General Francis Barlow was severely wounded. A Confederate bullet paralyzed his arms and legs. When Gordon, in the midst of his attack, saw Barlow, he dismounted, gave Barlow water from his can-teen and saw that he was cared for. Another instance where a Mason’s compassion and care for his brother transcended the hostility normally found between enemies. Brigadier General Lewis Armistead was the only officer to pierce the Union line. As Armistead crossed the low stone wall that formed the front of the Union defense line, he shouted, “Give ‘em the cold steel boys!” Holding his black hat on the tip of his sword to guide his men, since all his color-bearers had been killed, he led his 150 Virginians amidst the swirling tide of blue-coats. Placing his hand on a hot, smoking Union cannon barrel, he claimed it his, in the name of the Old Dominion. Instantly he was struck by two bullets and fell, giving the sign of distress, “. . . as the son of a widow.” At the same time, Major General Winfield Scott Hancock, the general commanding the Union troops defending the line at the center of the Confederate attack saw his old friend and Masonic brother fall. Hancock, a member of Charity Lodge in Norristown, Pennsylvania, who was severely wounded at the same time, ordered his chief of staff, Captain Henry Harrison Bingham, a Mason from Philadelphia, to go to Armistead’s aid. Bingham had Arm-istead taken to the 11th Corps field hospital where he received the best medical care possible. When Armistead died, Hancock saw that his personal belongings were handled according to his wishes. The Armistead-Hancock story is most unusual, especially when you consider that they were, in fact, enemies. But it is not unusual when you consider that they were Masons. Again we witness the power of brotherly-love, care and concern ... transcending the most severe hatred and hostility associated with battle. Come with me, to that chill, damp, Easter Sunday morning on April 9, 1865, in Appomattox, Virginia, when over 112,000 well-fed and well-equipped federal soldiers surrounded the 26,765 starving, ragged Confederates—all that remained of the once invincible Army of Northern Virginia. It was a time for the Yankee’s to shout and cheer! It was a time to celebrate. It was the end of the war—the bloodiest, in American casualties, that the world had ever seen or would ever see again. 618,000 men became casualties. But, the killing years were finally over! No one would have disputed the Yankee’s right to scream, shout and cheer. But when Confederate General John Gordon brought his battle hardened Stonewall Brigade on the field to lay down their guns and furl their tattered flags, Union General Joshua Lawrence Chamberlain ordered his men to give their former enemies a full military salute. It was an honorable and heartfelt act. It was the first act to heal the wounds of a nation and that greeting was given by a Mason! It was an act that uplifted the spirits of every man present. But then what would you have expected? 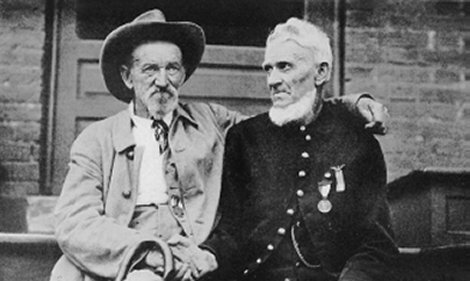 Remember that both Joshua Chamberlain and John Gordon were Masons, representing a brotherhood that was never divided, now dedicated to a nation indivisible. Drewry Easley was too young to have been a Mason at Gettysburg. He was born June 5, 1844, making him only 19 at the battle (but he did later join the lodge at South Boston, Va.), therefore, he could not have recognized a Masonic sign by Federal soldiers during the charge. Before Wendy's -Bro. Benjamin Franklin-?